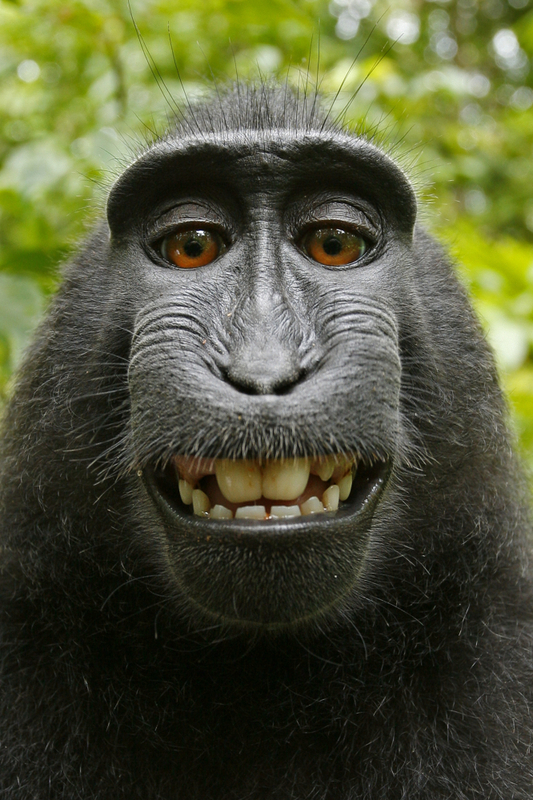 OK, as it is Friday afternoon, it is time to examine the monkey in the room: who owns copyright when some narcissistic non-human takes a selfie with a human’s camera? According to legal opinion, the answer is: not the human. What that means, is that as only humans can own copyright — well, and there isn’t an obvious corporation around — that no one owns the copyright. Up until recently, this was, basically, a law school exam question. But then the monkey in the picture changed all that. I’d offer an image credit but I don’t know this monkey’s name. The primate went to investigate the equipment before becoming fascinated with his own reflection in the lens. And it wasn’t long before the crested black macaque hijacked the camera and started snapping away sending award-winning photographer David Slater bananas. David, 46, said: “One of them must have accidentally knocked the camera and set it off because the sound caused a bit of a frenzy. “At first there was a lot of grimacing with their teeth showing because it was probably the first time they had ever seen a reflection. “They were quite mischievous jumping all over my equipment, and it looked like they were already posing for the camera when one hit the button. “The sound got his attention and he kept pressing it. At first it scared the rest of them away but they soon came back – it was amazing to watch. “He must have taken hundreds of pictures by the time I got my camera back, but not very many were in focus. He obviously hadn’t worked that out yet. Back in 2011, there was debate as to who owned the copyright but without resolution. This became more than a theoretical issue when the Wikimedia organisation — an organisation that, if you have ever tried to upload a photo to Wikipedia, you will know that they are no slouches when it comes to aggressive copyright enforcement — decided that there was no copyright on this image. So who actually owns the photo? Wikipedia is probably right to say it’s in the public domain; even if the monkey had an owner, it’s unlikely they would be able to claim copyright, especially given the fact that it was taken by accident. And the animal itself is unlikely to complain. “In all my years, I’ve never had a monkey walk into the office and have me represent it,” says Newberg. Now, this has prompted some outrage — mainly on behalf of the photographer. Slater travelled all the way to Indonesia and walked three days to interact with the rare crested black macaque. Now he has no rights to the image. “Now Wikipedia are using the image on their website for free which means people are just taking it off there potentially costing me thousands of pounds in sales. At this stage, Slater’s hope rests on his word against the monkey and whether they engaged in a collaboration. But I want her to suggest that this issue does not represent the ruination of copyright. Here is the thing: these pictures have most of their value precisely because they were taken by the monkey. The composition and the expression are all because of that. It could not have arisen any other way. Nor would it have had much additional value if it had not been taken by a monkey. Let us all be clear about this: it is the fact that the monkey worked out how to use the camera and take the picture that led to most, if not all, of the picture’s value. And if Slater couldn’t compete, it is surely his own artistic fault. What is more, there were alternative paths to appropriability open to Slater. For instance, he had hundreds of monkey images. All in great quality. He could have released them as a book. What a great gift for a coffee table. Yes, you might argue, he was exploiting the monkey but, as we all know, the monkey didn’t have the copyright and by gollie, there isn’t room in this market for two or more monkey selfie books. I think he could have done well. Second, what if some animal does shoot the perfect shot while you are out alone in the jungle? Unless you have an overly moral sense, one suspects that so long as you are willing to not tell the whole frigging world who took the picture, the secret is safe and you could pretty much assert copyright without there being much in the way of a legal contest; well, unless the monkey in question is Caesar. Computer generated artworks have already trailblazed this area. Since the photographer did travel to the location, owned the equipment, was present – even minimally so, those laws (if we were talking about a computer instead of an ape) would have sided with the equity holder – the photographer. While wikimedia is legally right technically, it’s hard to say they are on a moral or even by intent of the law. Previous PostPrevious Piracy Undermining Content Creation: Loch Ness Monster or Black Swan?